When it comes to engine development and testing, what you don't know can hurt you. Whether you're building an entire engine or one specific component, you may need to factor in hundreds of variables. The SPINTRON is the only tool that allows you to independently test and evaluate nearly every one of those variables in order to maximize performance and durability. Unlike other test systems, the SPINTRON gives you "live" results on your screen, plus comprehensive reports you can print immediately or store for later analysis. 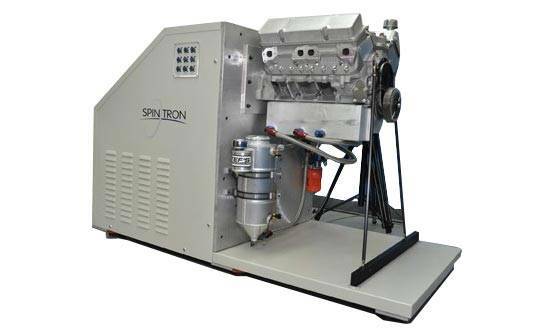 Use your SPINTRON to run durability tests, component failure analyses, and frictional horsepower checks on all your valve-train and bolt-on components… and take the guesswork out of your engine program. The Development of SpinTronThe first SpinTron built was sold to Hendrick Motorsports in the early nineteen-nineties. Randy Dorton, who lost his life in a plane crash on Sunday, October 24, 2004, was instrumental in its acquisition. 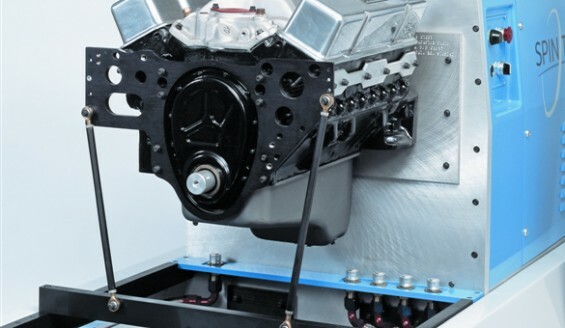 At that time Bob Fox, the proprietor of Trend Performance and the motivating force behind the SpinTron, had successfully developed pushrods for small-block and big-block Chevrolet competition engines, and he wondered what the next logical development might be. His keenest desire was to test and observe the behavior of pushrods at unusually high engine revs and to learn where and why they would fail. How does the SpinTron work? 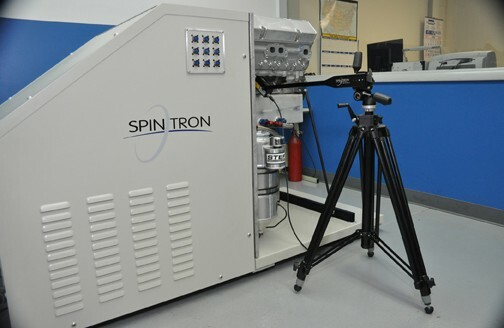 In simple terms, the SpinTron employs a high-powered AC electric motor to spin the crankshaft and valve train of the test engine while an advanced laser camera is used to track the valve motion and pushrod behavior. The data is transmitted to a computer in the form of a bell graph. Unlike other test systems, the SpinTron gives you "live" results on your screen, plus comprehensive reports you can print immediately or store for later analysis. The valve train is arguably the most critical and sensitive portion of the engine. That's why we developed our Laser Valve Tracking System (LVTS). With the LVTS, you can precisely identify, document and record crucial characteristics of the valve train such as valve bounce, lofting, spring harmonics, and pushrod deflection. To use the LVTS, first create a baseline valve trace by tracking the valve at a stable engine speed (typically 2,000 – 3,000 RPM). Then increase the engine speed to the next RPM you've preset in the test set-up screen. The SPINTRON will record and graph each new valve trace over the baseline trace. This will allow you to compare valve-train stability at various RPM, which is an ideal way to prove or disprove new products, theories and materials. 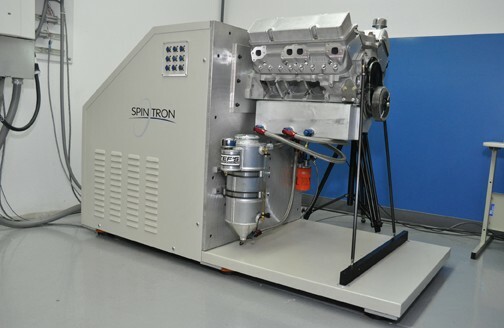 The SPINTRON will perform these tests at speeds from 500 to 20,000 RPM. Until 1993, meaningful research into valve train testing was not possible. It was only when the first SpinTron emerged, a revolutionary new valve-train test machine, that profound inadequacies in pushrod design were revealed. Step testing allows you to test bolt-on components or a complete valve train at various engine speeds. With the step testing software, the SPINTRON spins the engine at each RPM you've entered in the set-up screen. It records and graphs data from a variety of sensors at each speed, then moves on to the next set of RPM. This is an excellent way to test oil pumps, because you can record vacuum, flow, pressure and horsepower required at each step. It's equally effective for determining optimum performance for power-steering pumps, fuel pumps, timing sets and other components. You can run these tests at speeds from 500 to 20,000 RPM. Nothing beats the SPINTRON for cost-effective endurance testing. With the SPINTRON, you can simulate hundreds of race or street miles. During these simulations, you have the ability to test just one component (such as a single spring) or a set of components (all 16 springs). You can also test parts against each other (such as 16 different spring designs) at the same time. 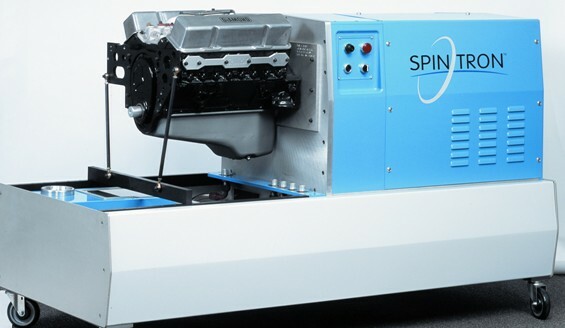 The SPINTRON software allows you to increase the RPM usually experienced at a given race track during typical conditions beyond normal engine speeds without the risk of expensive piston, crankshaft or connecting rod failure. That's because none of these components is required to run the SPINTRON.